The avatar is an image, that represents you in Skype (or somewhere else on the internet). You can use your real picture, but you can also use something completely different and fun. 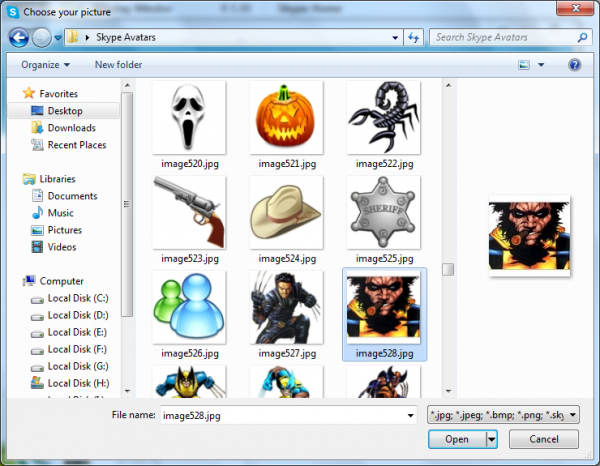 Skype does not allow the use of animated images (GIF files) and this is why I will show you here only static avatar images. Click the button in the top right to download an archive of 858 avatars for Skype. They are all collected from these three sources: www.internetvibes.net, phantomreality.net and cool-avatars.narod.ru. How to change your avatar picture in Skype? Open Skype and sign-in with your username and password. In the menu go to: Skype -> Profile -> Change your picture. In the window click the button Browse…, select the file and click Open. Click OK (or Use this picture). Open Skype and sign-in with your username and password. In the menu go to: File -> Personalize -> Change your picture. In the window click the button Browse…, select the file and click Open. Click OK.